SAP SMP 3.0 Creating a MBO from an SAP Adaptive Server Enterprise. SUP 3.0 SDK or higher. This document assumes you have a working SUP environment. You need to have access to Adaptive Server. You need to have pubs2 database installed. User needs to connect and consume data from Adaptive Server. In order to connect to ASE you need to create a connection in SUP Workspace. 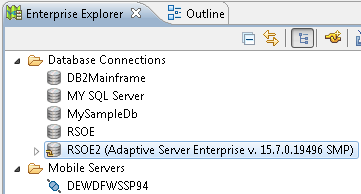 Go to the Enterprise Explorer. Right Click on Database Connection. 5. 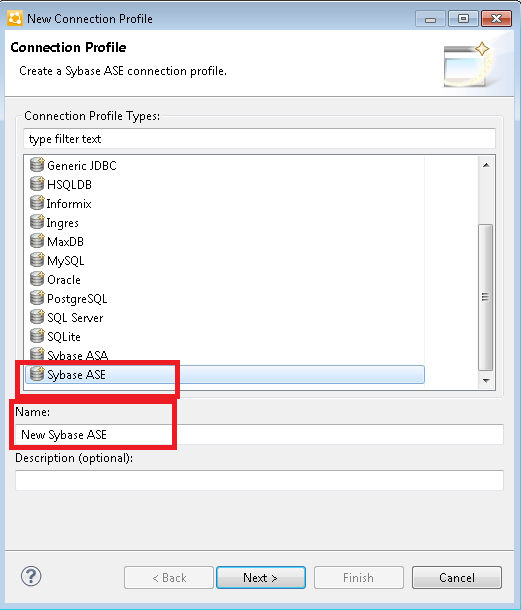 From the Connection Profile Type: select Sybase ASE. 6. Under Name: Add the name you would like to use for the connection object. it will fail you have to add a password for security. 8. Add your hose name or TCP/IP Address. 9. Add the Port number the ASE is listening on. 10. Add the default database name that you are using. 11. Add your User name. 12. Add your Password NULL password is not supported. 14. Click on the Test Connection Button. This concludes the setting up the connection for the Adaptive Server Enterprise. User needs to create a MBO from Adaptive Server Enterprise. In order to do that, you will need to do the following steps. 15. Start or open the SUP Workspace. 16. Go to the Enterprise Explorer. 17. Right click on Database Connections and select from the menu Connect. 18. Go to the folder Mobile Servers tree open and connect to the SUP Server. 19. 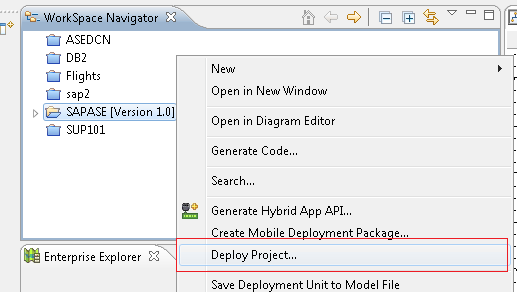 Go to the top left menu File and select New -> Mobile Application Project. 21. Go to your Adaptive Server connection. 25. Go to Attributes and add Primary Key for au_id. 29. Follow the prompts and click OK. This Concludes creating the MBO from the SAP Adaptive Server Enterprise. Checking the status of the MBO in the SUP Server. In order to get an idea of how the deployment works we can check in SCC. 30. First start the Sybase Control Center. 31. Login using supAdmin or an account assigned to you. You will see the authors table this means we are now binding the table in SUP to Adaptive server. This concludes the creation and deploying the Mobile Business Object to the SUP server. This document explained in details about the steps needed to create a connection to the SAP Adaptive Server Enterprise. 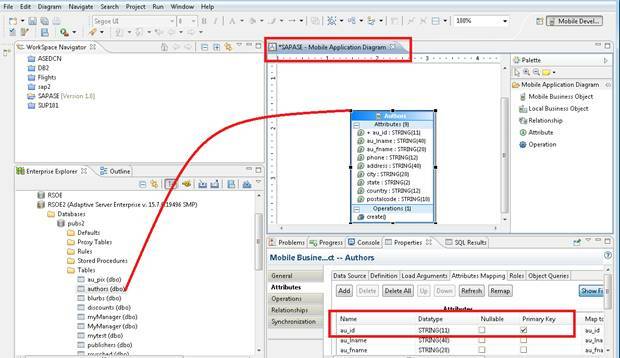 Create the Mobile Business Object and deploy to the SUP Server. 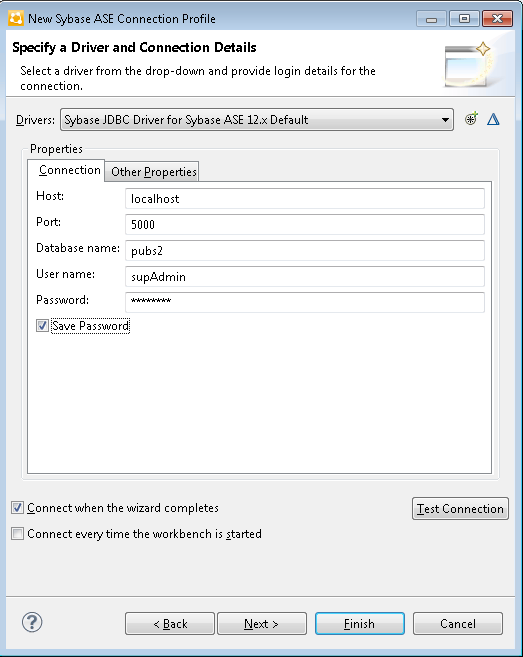 Confirming the deployment of the MBO to the SUP server thru Sybase Control Center. platform. It is cost affective using what you already have.